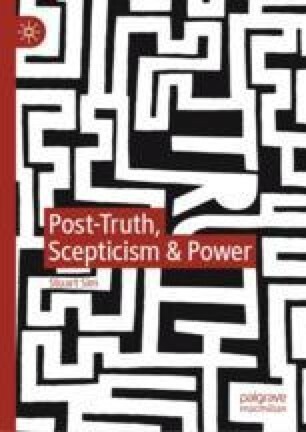 Post-truth also has a pre-history, and this chapter looks at some selected examples of this in terms of government-generated propaganda, as well as such notorious publications as the ‘Zinoviev Letter’ and The Protocols of the Elders of Zion. The latter two texts are prime cases of conspiracy theory in action, and the post-truth element in this is explored, as well as the adverse impact it can have on political life. The Protocols in particular have been used to whip up antisemitic feelings over the course of the twentieth century, and still attract followers into our own day. Reference is made to Umberto Eco’s novel The Prague Cemetery, which speculates how a text such as this could come into being and find such support. Post-truth tendencies within Soviet communism are also considered. Suskind, Ron, ‘Faith, Certainty and the Presidency of George W. Bush’, The New York Times Magazine (17 October 2004), www.sscnet.ucla.edu/polisci/faculty/chwe/austen/suskind2004.pdf (accessed 20 February 2018).